If you'd like to review or discuss any tea-related books, magazines, or articles, please feel free to post them to this thread. - Tea culture, philosophy, or "ambiance"
What is your favourite tea book? I only own currently four books on tea. Le guide du théophile a short guide from the shop "le palais des thés"
A nice guide for beginners, nothing more. New tastes in green tea a 128 p guide on japanese green tea. Some good green tea based recipes, nice photos, a brief history on japanese tea. Only 15$ so if you like japanese green tea and cooking, you should buy it. The tea ceremony which I received and wrote about yesterday in teaday. The book of tea by Kakuzo Okakura. A classic. Mary R wrote: If you'd like to review or discuss any tea-related books, magazines, or articles, please feel free to post them to this thread. Part I is a brief history of tea, which includes how tea is produced and processed, tea grading, tea taster vocabulary, teaware, and brewing methods. Photos are lovely. Part II is a nicely organized directory of teas by country of production. Included are many photos of tea plantations. The spring issue of "Kateigaho International Edition" magazine has a great article on the making of chasen and chakin (that's tea whisks and tea cloths). There are a couple of pictures at http://int.kateigaho.com/list_23.html and much more in the article. While not a tea magazine, KIE is an awesome look at Japanese culture and traditions. Salsero wrote: BTW, tea book lovers. Any and all are welcome to sign on, get a user name, and post a review of tea books at Wikicha, the tea info center of the future. Many step by step photos on how to perform a tea ceremony, some tips to do it at home. This time a specialized book. Too specialized for the use I will make of it, but giving very interesting details, all the names of flowers, utensils and foods for chanoyu. I bought it mainly for the food description. There aren't any recipes though, but a thorough description of each and their name in both Japanese and English transcription. olivierco wrote: This time a specialized book. I absolutely love this book - although most people may find it a little too specialized. I really appreciate the sections on kigo, seasonal words for the month. Part of tea practice is to assign a gomei (honorary name) to utensils such as the chashaku. So having a reference for tea-related kigo is very helpful! I find it too specialized as I don't practice tea ceremony (yet?). But it is definitively a great book. How easy is it to follow the instructions from the pictures alone? Or do you read Japanese? Many pictures to detail tea ceremony and for the price, you have a 90 min DVD (allzone) corresponding to the book. 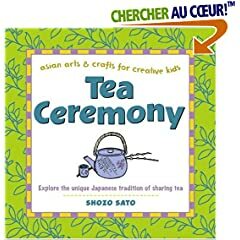 I just got this out of the library, on The Japanese Tea Ceremony. It looks excellent so far. Some great color plates, and a lot of history.